In November 2017, IOM assisted 243 Guinean migrants in returning home from Libya under its Voluntary Humanitarian Return programme. 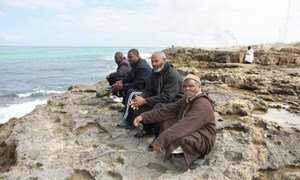 Since last November, 10,171 migrants have safely returned from Libya, the United Nations migration agency announced Tuesday, crediting the achievement to a scale up of its Voluntary Humanitarian Return (VHR) programme. “We are continuing to assist migrants inside Libyan detention centres, while increasing efforts to reach stranded migrants outside of detention,” said Othman Belbeisi, Chief of the International Organization for Migration’s (IOM) Mission in Libya. In the same period, another 5,200 migrants have returned with African Union (AU) support. “Since the expansion of our VHR operation, the number of migrants in official detention centres have dropped from an estimated 20,000 people in October 2017 to 4,000 people today, a five-fold decrease,” he continued. “IOM in Libya is also working with the authorities to register migrants, provide lifesaving assistance in the form of health care and essential aid items, psychosocial support, improve consular services and projects promoting community stabilization,” Mr. Belbeisi added. With partners, IOM has been scaling up activities to meet the surge in returnees and ensure assistance upon their arrival, and in the longer-term – to readjust to their communities. The programme also offers reintegration assistance for those returning from EU States. IOM Regional Director for the EU, Eugenio Ambrosi, said that the VHR operation’s scale of protection needs and number of returns have overtaken initial planning and pose challenges for countries of origin. However, he cautioned that as many returnees from Libya are traumatized after having suffered unspeakable abuses, saying their immediate medical and psychosocial needs have taken priority. The new, reintegration approach aims to mitigate tensions by involving local communities at home in the process and raising awareness to address return stigmas, which is why capacity building, social, psychosocial, and community-based aspects are being built into the programme. “The initiatives we are undertaking with the EU and our African partners represent a new chapter in migration cooperation,” underscored Mr. Ambrosi. “It is the first time that substantial funding has been invested to support the priorities and capacity of partner countries to manage return and reintegration and to make migration itself a safer and informed process,” he concluded. The United Nations and its partners in Libya have called for the voluntary, safe and dignified return of the population displaced from the northern town of Tawergha without a delay, expressing deep concern about the situation faced by these people living in makeshift-tented settlements in nearby areas.